We use chickens in our garden every season to lower our workload and enhance our soil. Particularly, if you’re interested in permaculture, then this episode of What The Cluck?! is for you. One of the easiest ways to get a third use out of your chickens is to use them in your garden. You’ll save time, money, and energy. In this episode of What The Cluck?! we explore how to use chickens in your garden. Hi there, and welcome to session 12 of What the Cluck? !, a podcast devoted to keeping chickens for fun and self-sufficiency. I’m Maat from FrugalChicken, and in this episode we’ll look at ways to use chickens in your permaculture garden, and while this seems like an odd time to talk about it, it is December after all, now is the time to implement these ideas. 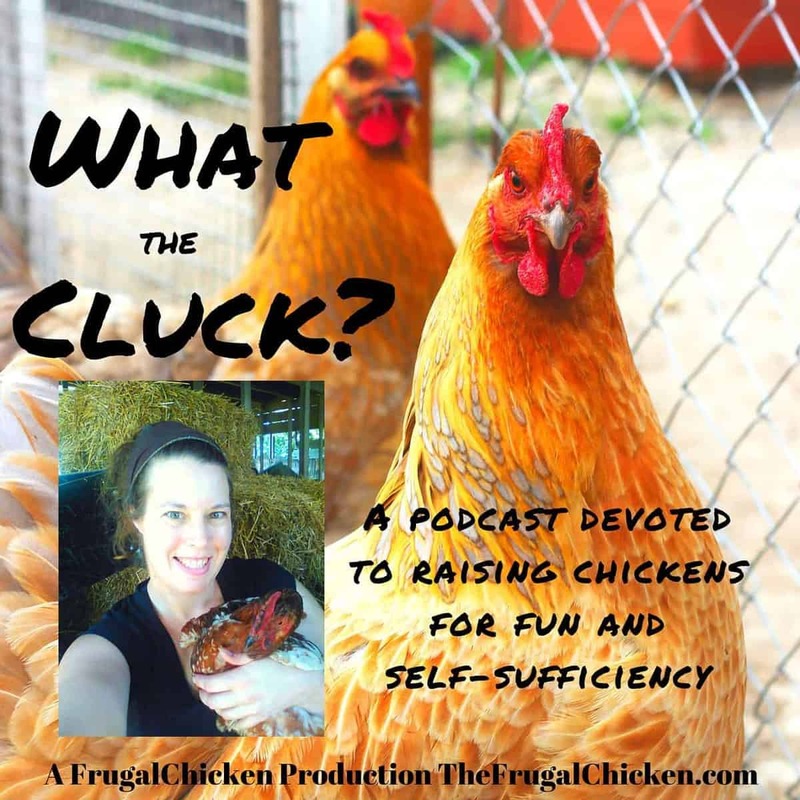 Whether you currently own chickens or not, you’ll love this episode because you’ll learn about how chickens can contribute to your homestead beyond just the usual eggs and meat. If you don’t own chickens, but need to convince a family member why chickens are advantageous, there’s a lot in the episode for you. If you own chickens, but just use them for eggs and meat, you’ll learn a third way chickens can “earn their keep” so to speak, especially in the winter when they stop laying. Now before we get started, I just want to briefly mention a company that I love and that’s Thrive Market. Why do I love them so much? Well, first off, if you don’t know what Thrive Market is, it’s an online organic supermarket, and it’s a little like Costco meets your favorite farmers market. I personally buy a lot of the products I can’t make myself from Thrive Market, and I’m talking about products like coconut oil, chia seeds, and raw honey. Products that we use every day at home to lead healthier lives. Thrive is membership site, and their products are anywhere from 15% to 20% cheaper than I’ve found elsewhere. So when it comes to your chickens, having raw, organic items on hand, such as honey, becomes extremely important in traumatic injury cases if you use honey as a natural antibacterial to reduce the possibility of infection, and I personally source all of my raw organic honey from Thrive. I value my Thrive Market membership, and love that it’s a company with a conscience. As a green company committed to sustainable practices, all their products are ethically sourced, and I feel confident buying from them that I’m doing the best I can for our environment. Another thing I love about Thrive Market is that for every membership they sell to someone like you or me, they give a membership to a family in need. So, it really is shopping for products you will use anyway in a way that benefits other people too. You can join Thrive at thefrugalchicken.com/thrive, and that is an affiliate link, so thank you if you decide to use it. So, let’s get into why where here, which is to talk about 7 ways you can use chickens in your garden. The first thing you’ll notice is that I’m talking about gardening when it’s December. While this might seem a bit peculiar, the truth is that a lot of what we’ll discuss today are things you should be doing now to prepare your garden for the spring. On this list of ways to use chickens in your permaculture garden are things you can do in every season. And the best part is your chickens have another way to earn their keep. If you have chickens that are older and don’t lay as much, but you don’t want to get rid of them, then giving them a new job is the way to go. So the first way you can use chickens in your permaculture garden is as tillers. Chickens have long claws which they obviously use to dig up goodies in the dirt. We can use these claws to our advantage by using them to till up the garden at the end of the season. So, let’s say you planted lettuce as a fall crop. Why not let your flock feast on the leftovers as a treat, and while they’re digging in the garden, they will till the leftover vegetation into the ground, where it can compost. On a cooler winter day, when there’s not much for them to forage for, this can be a really exciting treat for them while being a huge advantage to you. Now, I can speak from experience that chickens left on a patch of grass will eat every last blade if given the opportunity. So whether you’re looking to have an existing garden tilled or want to use your chickens to establish a new garden, you’re in luck. Whenever we’ve had to create a new garden bed, we’ve first sent our chickens into the area to let them eat whatever vegetation and weeds they can. It reduces our workload. In the end, you’ll be left with a garden full of loose soil. So the next way you can use chickens in your garden is a little indirect, but it’s still very important. Your chickens egg shells are so good for your permaculture garden because let’s face it, they’re 98% calcium. One option is to put the shells into your garden and allow them to compost over the winter. You can use this idea in tandem with our first idea, and allow your chickens to incorporate the egg shells into your garden with their scratching. Your chickens might eat the egg shells, but they’re unlikely to eat all of them and the remainder will enhance your garden. Now, if it’s spring in your area, you can still use egg shells in your garden. Egg shells are naturally rough and deter slugs and snails, and are a great organic way to keep these pests away. Tomatoes, peppers, and eggplants thrive when you add calcium to your soil, so include them in your garden to give a boost to your crops. And this works regardless of the season. The calcium in eggshells also raises the pH level of your soil, so if your soil needs its pH altered, this is a good option. Now another idea for egg shells is you can grow seedlings in them. Then, when the plant is big enough to transplant outside, you place the shell in the dirt along with the plant, and the seedling gets extra calcium. This idea is better for your spring permaculture garden obviously. Now the third idea to use chickens in your permaculture garden that we’ll talk about is manure. So, as you probably know, chicken poop is one of the most sought after fertilizers out there, and I can attest to this because the farmers around us spray their feeds with the stuff to fertilize them, and yeah, it’s pretty rank. But that tells you how good chicken poop is, and it’s particularly high in nitrogen. You can save a ton of money this way, since organic fertilizers are not exactly cheap, right? And it’s another nice, green way to help your garden and close the organic circle, so to speak. So the thing about chicken poop is there is a small potential for pathogens that hide in their guts like E.coli, Salmonella, and others. So, that’s why we’re talking about all this now, when it’s winter. You can put the chicken poop in your garden now, and over the winter, the cold temperatures and freezes will kill off those pathogens. The recommended length of time is 3 months. As an aside this is another good reason to feed your chickens fermented feed. Studies show that fermented feed decreases the amount of harmful pathogens in a chicken’s digestive system, and helps increase the beneficial bacteria, like lactobacillus. 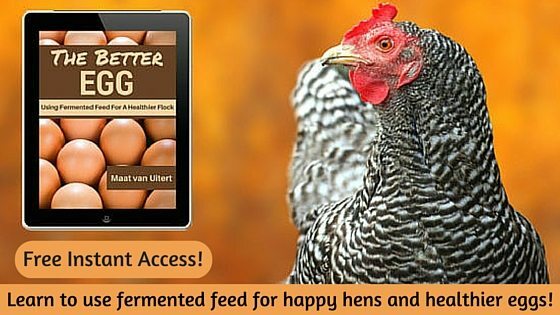 In my course Feeding Your Hens Right, we cover how to make fermented feed. The URL for that course is FeedingYourHensRight.com, and I’ll put that link in the show notes. So, if you want to use chicken manure in your garden, but don’t want to go through the hassle of gathering it, then a chicken tractor is a great idea. It will also keep predators away from your chickens, and as they peck and scratch through your garden, they will drop manure, which you can then let compost over the winter. If you live in an area that doesn’t get freezing weather, composting the manure is another good idea. The Heat in a compost pile will kill off the pathogens as well as freezing weather. Bacteria don’t like extremes, like high heat or freezing weather. If you want to use a chicken tractor in your permaculture garden to ensure the manure goes where it should, I have an article on the blog which shows you how to build a tractor out of reclaimed wood. You can find that article at TheFrugalChicken.com/tractor, and I’ll put that link in the show notes. Another option is to create a compost tea with your chickens manure that you can use in your permaculture garden. To do this, place some of the manure into water, and allow it to soak for a few hours before spreading on your plants. It’s a great way to put some nutrients into your plants without placing the manure directly into your garden. But the bottom line is if you want to use your chickens manure in your gardens, it’s a great way to give a nutrient boost and use your chickens in your garden. 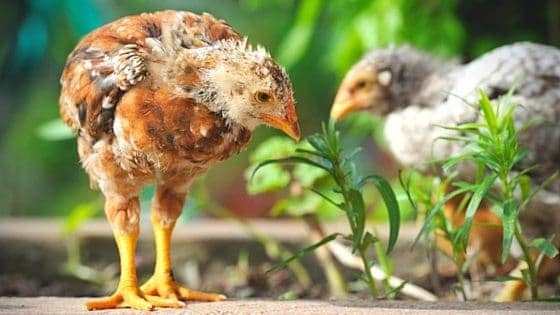 The fourth way you can use chickens in your garden is to let them clean up the plants and vegetation at the end of the season. We talked about this a little bit, and it’s a great way to give your chickens some excitement and a treat while reducing the amount of work you have to do. I have some friend who do this, and because of space limitations, they have smaller gardens and try to grow as much as they can in a small area, they have to be ruthless at the end of each season and pull plants at the end of summer so they can plant their fall garden. To reduce the amount of work, they let their chickens into the garden, which is normally walled off with wire, and let their chickens and other poultry go to town on left over tomatoes, peppers, etc, before completely pulling everything. For those few days, they save a bit on feed, provide a varied diet, and give their chickens some entertainment. The chickens drop their manure, and help spread dead vegetation which will then compost into the ground, adding nutrients to the soil. The remaining plants in your permaculture garden can then be pulled and composted. The fifth way you can use chickens in your permaculture garden is as bug patrol. And I can attest that chickens are excellent bug patrol, and they see things and scratch things up that we as humans would never find. It’s quite amazing really. I’ve talked a bit about this before, but we actually have dedicated bug patrol chickens on our farm, and they’re chickens that no longer lay. We’ve found that they’re some of the best bug control I’ve ever seen on a farm, and that includes horse farms that use pesticides to kill insects. Now, I don’t suggest using your chickens as bug patrol if you’ve planted seedlings because you’ll likely lose all your plants since they’ll eat the plants or scratch them all up. But right before you plant, let your chickens in there for a few days to dig up ground grubs that can interfere with your plants health or whatever else they find in there. Chickens are also good at getting rid of ticks, and if you’re outside for any length of time, I probably don’t need to explain why that’s advantageous. When your plants are established, you can let them into your permaculture garden again, but I suggest watching them to make sure they don’t do too much damage to your plants. But chickens are a great way to keep the bug population low. One way I use chickens on my homestead is to aid in composting. And this is in the permaculture garden but also in our regular compost pile. So, maybe you know this, maybe you don’t, but we have horses on our homestead, and they make A LOT of manure. So much that we’ve had neighboring farms ask us about composting it for them to use on their farms. So, the thing about horse manure is it’s huge and when it dries, it’s hard to break down. But the chickens make easy work out of breaking it down so we can compost the manure more quickly, which makes it great for a permaculture garden. We also like to spread it in the garden during the fall so it can breakdown over the winter, and the chickens help us reduce the clumps of manure into a thinned out layer. We do something similar with our quail poop. So the quail live in a hutch, and the bottom of the hutch is hardware cloth. So, their poop just drops through to the ground, which makes a cleaner cage for them. The chickens love sorting through this poop and at the same time, they help compost it for us, so we can put it on our garden later in the winter. So the final way that you can use chickens in your permaculture garden is to use them to spread mulch. This is an idea we got from watching our horses spread stall shavings around. When we clean our horse stalls and rebed them, we don’t bother spreading the new shavings around because the horses will do it for us, whether they paw at the shavings to spread them, circle their stalls, or decide to roll in them. Anyway they do it, they still do the work for us. With chickens, it’s no different. So it struck us one day, as we were laying mulch around some blueberry bushes, why not let the chickens spread everything around, and then go back and fix the areas they missed and smooth everything out? The chickens get some excitement being able to scratch to look for bugs and other goodies in the permaculture garden, and our workload is reduced. Of course, if you have tender seedlings, I don’t recommend using them to spread mulch, but if it’s the start of the season, or the end of the season, or your overwintering root veggies or garlic, then letting your chickens spread the mulch for you might be useful. If you’re using something like hay, then this is particularly useful. I’ve found when using hay as mulch in your permaculture garden, you can run into issues with weed seeds sprouting. Letting your chickens make a run over it reduces the potential weeds that can sprout while giving your flock something exciting to do. Personally, my chickens love sorting through hay and straw to find whatever it is they find in there. I’d love to hear about how you use chickens in your garden, so there’s something I want you to do. I would love it if you dropped me a line at editor@thefrugalchicken.com to tell me what rare breeds you raise and why. Now, if using chickens in your permaculture garden interests you, but you’re still concerned about how to best feed them so they’re productive and lay nourishing eggs, as can sometimes be the case when you use them in your garden since you’re less able to control their diet, then you’ll want to check out my new course, Feeding Your Hens Right, which you can see at feedingyourhensright.com. In this course, you’ll learn how to feed your chickens so they get an optimal diet and lay the most nourishing eggs possible. As we grow increasingly sophisticated in understanding where our food comes from and the repercussions of eating poor quality food, it’s important to understand how your hens diet effects the quality of her eggs. Anyone who has a wheat allergy and can’t eat store bought eggs will understand what I mean. A friend recently told me that if she feeds her chickens a wheat based diet, her son, who is wheat intolerant, will get sick. So, that right there is proof that your hen’s diet does effect the quality of her eggs, and studies have shown the exact same thing. I’m not making this up, researchers have proven it in several studies. If feeding your family the most nutritious food possible is important to you, then you’ll want to check out my course. It’s 5 video workshops, that you can access at any time. There’s specific recipes for homemade feed that can be tailored to your particular needs, and you’ll learn how to raise a happy, healthy flock of chickens. The URL for that course is FeedingYourHensRight.Com, all one word. Thanks for listening to this episode of what the cluck about using chickens in your permaculture garden, and I’ll see you next time! How do you use chickens in your permaculture garden? Email me at editor@thefrugalchicken.com or comment below! Did you know chickens save you ton of time and money in your garden? Here's 7 ways to correctly use chickens in your garden and reap the benefits.